For those that have been asking and waiting for me to finish up our Whole30 experience from January, this post has been a while coming but life happens, kids get sick and blog posts get pushed to the next day's to do list (and repeat) but it's finally here! 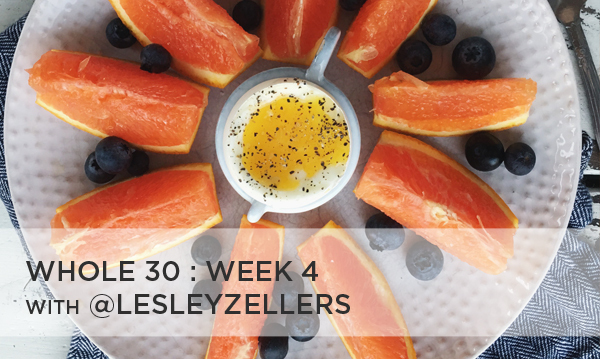 I planned on doing week 4's meals with my Whole30 experience recap (including answering a lot of your questions) in the same post but it got long so I'm posting the recap on Monday. If you are just joining, you can see what we ate during Week 1, Week 2 and Week 3 by clicking on the links. After surviving the weekend of week 3, we woke up to week 4 with determination and a little pride that we'd made it so far and how close we were to finishing! So here's what we ate to finish it off. Breakfast: fresh bananas, strawberries, blackberries and orange wedges with a 2 egg omelette topped with a bit of bacon, cilantro and avocado. Lunch: broccoli salad with a hard boiled egg (again, Instant Pot to the rescue), apple slices and almond butter. Dinner: grilled beef patty topped with grilled jalapenos, onions and guacamole with grilled broccoli and roasted sweet potato and roasted potato fries. Breakfast: fresh pineapple, strawberries and bananas with a fried egg over TJ's cruciferous crunch mix. Lunch: all beef dog topped with onions, cayenne and Siegi's mustard with sliced radishes and broccoli salad. Dinner: taco potato - baked potato with taco meat, onions, guacomole, salsa and "dump ranch". Breakfast: hard boiled egg with a chopped fruit salad of apples, bananas, blueberries and strawberries. Lunch: broccoli salad, plantain chips and salsa, sliced avocado and 2 hard boiled eggs. Dinner: @paleolithicfoodie's chicken cauliflower coconut soup. Breakfast: hard boiled egg with a chopped fruit salad of bananas, blueberries, strawberries and orange wedges. Lunch: spinach salad with chopped radishes, cucumber, onion and homemade chicken salad. Breakfast: orange wedges with blueberries, hard boiled eggs, cucumber and mixed nuts. Lunch: broccoli salad, hard boiled egg and a grilled chicken thigh. Dinner: pan seared steak and eggs. Breakfast: spinach, blueberry, almond butter, banana smoothie with chia seeds. Dinner: grilled steak, grilled artichoke and cauliflower and a baked sweet potato. Breakfast: bananas, blueberries and strawberries and 2 hard boiled eggs. Lunch: chopped salad with radishes, avocado, onion and grilled pork tenderloin and plantain chips. Dinner: pot roast with green beans, potatoes and carrots. Breakfast: kiwis and blueberries with a 2 egg omelette topped with leftover grilled steak. Lunch: chicken cauliflower coconut soup. Dinner: leftover grilled steak, baked sweet potato and sauteed cabbage. Breakfast: oranges, blueberries and a soft boiled egg. My girls call them "gooey eggs" and love them. You guys, I bought a Rosle Egg Cracker/Topper online a couple of years ago and LOVE it. It makes getting the tops off a cinch! Lunch: chopped salad with cucumber, blueberries, radishes, bacon and a hard boiled egg. Topped with balsamic vinegar and evoo. Dinner: Here's the thing. We started Whole30 on January 1 with breakfast and lunch and accidentally had a non-whole30-approved item so we decided to go through until the 31, making it whole31. So the evening of the 31st we started trying to figure out if we had to make another dinner or if we had met our goal of eating whole for 30 days. Since we technically ate more than 30 days of whole30 meals so we decided we had met our goal and ended the night by going out and getting some chips and salsa and margaritas. Did we fail because of that? I think not. Do I care if you think we did? Heck no. There you have it. Everything we ate the last 9 days of Whole30. Am I glad I did it? Heck yes! More on why I loved and hated it on Monday.